I’ve noticed that Judith Curry is discussing the early twentieth century warming. The idea is that there was a period of warming during the early twentieth century that was similar to the warming we’ve experienced since the second half of the twentieth century. Tamino has already pointed out that the warming since the mid-1900s far exceeds the early twentieth century warming, so I won’t say much more about that. The suggestion, though, is essentially that this early period of warming confounds our understanding of anthropogenically-driven warming. In other words, if it warmed this much during a period when we weren’t emitting much, how can we be confident that most of the modern warming is anthropogenic? As Judith highlights, there is a recent paper that estimates that about half of the early twentieth century warming was externally forced (anthropogenic and natural) and about half was due to internal variability. So, internal variability could have contributed 0.1-0.2K of warming during the early 20th century. This is entirely consistent with what we might expect over a period of a few decades. So, does this mean that internal variability could be responsible for a reasonably large fraction of the overall warming we’ve experience to date? Well, no. Internal variability can produce quite substantial warming on short timescales, but it’s very difficult for this to persist for a long time. By itself, internal variability just moves energy around. For there to be long-term warming requires some kind of response (for example, changes in clouds or water vapour) that prevents any enhancement in surface temperature from simply being radiated into space (which would happen in months without this response). However, since the system is long-term stable, these responses are – on average – smaller in magnitude than the Planck response (how much an increase in surface temperature changes how much energy we lose to space). Therefore, on long, multi-decade timescales, any internally-driven warming should decay back to the equilibrium set by the external factors (i.e., the Sun and the planetary greenhouse effect). It’s therefore very difficult for it to provide substantial warming on multi-decade/century timescales. There’s also a paradox. For internal variability to contribute substantially to our long-term warming, there needs to be some kind of radiative response. As I said above, this would be changes in clouds, or changes in water vapour. However, these also respond to externally-driven warming, such as due to changes in atmospheric CO2. As I try to explain in this post, if internal variability has produced more than half of our observed warming, then somehow the system is responding to internally-driven warming, but not to externally-driven warming. This doesn’t make any sense, as the climate system can’t know if some temperature change was internally-driven, rather than externally-driven. Therefore, arguing that internal variability could have contributed substantially to our observed warming introduces a paradox that noone who suggests this has ever addressed. Basically, the early twentieth century warming doesn’t really challenge our overall understanding of anthropogenically-driven warming. It seems likely that internal variability contributed to some of this early warming, but that doesn’t mean that it has contributed to a substantial fraction of our overall warming. It may have had some impact (~0.1K) but that can work in either direction. In fact, the overall analysis suggests that it may have produced some cooling since 1950, so that anthropogenic influences – by themselves – would have produced slightly more warming than we’ve actually experienced. Those who promote the role of internal variability typically seem, for some reason, to ignore this possibility. And then there’s the energy imbalance – post I wrote about the significance of the planetary energy imbalance. 95%, attribution, and all that – post I wrote trying to show how it’s very difficult to construct a physical plausible scenario in which most of the observed warming is not anthropogenic. 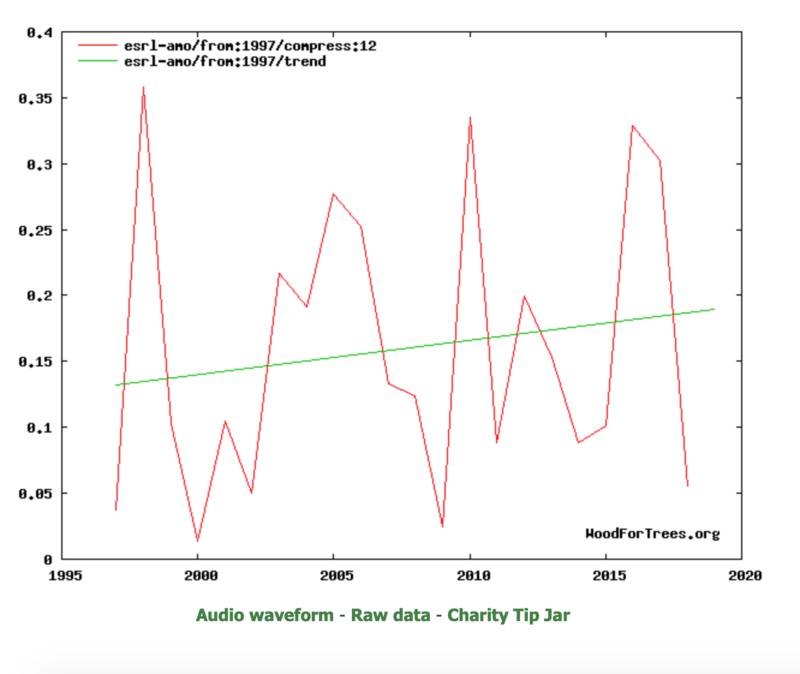 IPCC attribution statements redux: A response to Judith Curry – Realclimate post responding to Judith Curry’s suggestion that more than half of the observed warming could be internally-driven. The feedback paradox – post I wrote about the paradox of feedbacks operating only when the warming is internally-driven. Predictable and unpredictable behaviour – Realclimate post that also discusses the feedback paradox. This entry was posted in Climate sensitivity, ClimateBall, Judith Curry, Pseudoscience and tagged attribution, Climate etc., Internal variability, RealClimate, The feedback paradox. Bookmark the permalink. End of the first para doesn’t make sense. Don’t you mean the second half of the 20th Century to date? Yes, I had my centuries confused. There are a couple of other paradoxes here too. Firstly, in general, the larger internal variability is, the higher climate sensitivity must be, otherwise negative feedbacks would not have allowed the internal variability. Secondly, internal variability must, over some long time period, sum to zero. The more “natural” warning there was in the early 20th century, the more likely that the recent climate would have cooled rather than warmed as the system would more likely be above its long term average. So I think even if Judith were right about the magnitude of the earlier warming, and if it were all “natural”, it would point to higher climate sensitivity and a larger fraction of recent warming to be anthropogenic. That’s how it seems to me at least. For me the article reads as if Prof. Curry is interpreting this as meaning we have no understanding of early 20th century warming at all, which is obviously not the case. This is made rather worse by using it as a means of attacking the IPCC’s projection of future warming, but not mentioning what the IPCC has to say about early 20th century warming. This seems rather unfair as they present model results that are clearly able to reproduce early 20th century warming via a mixture of natural and anthropogenic forcing. Oddly enough we can see from this diagram that natural forcing is responsible for some but not all of the early 20th century climate change. Land use change dominated fossil fuel emissions until surprisingly late (1950s or 60s? ), so we should expect to see an anthropogenic contribution even in the early 20th century. A lull in volcanic activity is also likely to have had an effect. The "known external & internal forcings explain all the main variations in GST between 1891-2015"
Indeed, those who argue for a large contribution due to internal variability (or to a very warm Medieval Warm Period) never seem to recognise/acknowledge that this would imply that climate sensitivity is higher, rather than lower. 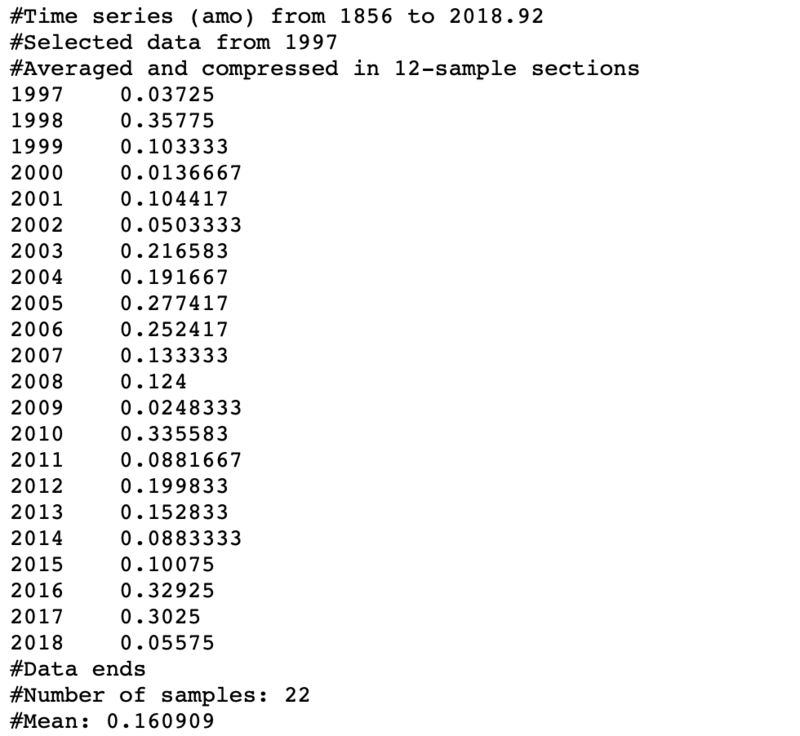 The paper Dikran linked provides a nice analysis of how well observations match both reconstruction from known forcing and CMIP5, period-by-period since 1891. Its an oversight on Curry’s part not to include it. Interestingly, the cooling period that proceeds 2011-40 is poorly explained by both models and reconstruction from known forcing. On-the-other hand roughly 2/3 of the 2011-40 warming is well explained by man-made and natural forcing. Any “missing warming” in 2011-40 is easily explained as a recovery from cooling in the proceeding period. So it pays to be leery of any period analysis that doesn’t consider what came before. I’ve seen this argument me many times. Bebe you ever had a”skeptic” make a counterargument? I’ve seen this argument made many times. Have you ever had a ”skeptic” make a counterargument? For the higher frequency changes in the rotation rate, these have all been pinned to tidal forcing variations, but it’s not clear what these multidecadal variations are due to. As BBD says, “not coherently”. The best I’ve seen is a suggestion that maybe the pattern of warming could be such that some internal perturbation happened to warm exactly the right regions so that the feedback response is sufficient to sustain this despite the Planck response. The problem is partly what would then stop ocean currents from re-distributing this energy so that the system cools back down again, and we would probably see this pattern. And let’s go to the extreme limit, that it’s pretty much all internal variability. Well, first of all, you are talking immediately about a low-climate sensitivity, much lower than the consensus picture, because otherwise the forced response would be there. If you are saying it’s mostly internal variability, you are talking about a very low-sensitivity system compared to the consensus picture, which means that we are talking about, say observed warming So, you would have a huge outgassing of heat from the ocean because that’s what you mean by “low-sensitivity model.” For the same warming, you get a huge output of energy trying to restore that. And for the same forcing, I am assuming the forcing estimate is not uncontroversial. You have heat coming out of the ocean. That’s the bottom line. We don’t see that. The other one is spatial structure. And these things, again,are implicit in various fingerprinting studies. ….. Where do you expect low-frequency variability to emerge in the coupled climate system? It’s going to emerge at high latitudes because, where you have memory on these multidecadal time scales is in the deep ocean. And where is the deep ocean coupled efficiently to the surface? It’s in subpolar regions. That’s where the ocean is least stratified. The tropics are just too strongly stratified for those time scales. You look at where models predict their lowest-frequency variability. There was a nice paper by Del Sole looking at the models. And he finds a pattern in all the models that have the largest integral time scale or decorrelation time. They are at high latitudes, especially the northern North Atlantic. This plot doesn’t go to the Southern Ocean, but you would see high variability in the Southern Ocean as well. And that’s just the opposite of what you see in reality. In fact, in a forced response, you expect to see an orthogonal pattern, more or less. I won’t quote any more, but you can read the whole discussion starting on page 411. The basic idea is that if long-term (low frequency) internal variability was dominating warming on 50-100 year timescales, you would expect to see the warming emerging in the sub-polar ocean. This isn’t what is observed. What’s observed is a more spatially uniform warming, which is consistent with a forced responde due to GHG-driven warming. How can LC18 use such short time intervals if natural variability has such a large impact? I don’t think LC18 used a short time interval. They were considering the difference between decadal averages in the mid-1800s with decadal averages in the 2000s. I would consider decadal short particularly if Curry is suggesting longer term influence on natural variability. They only consider AMO, ENSO and volcanoes. Just pointing out inconsistencies. Okay, I see. They do assume that the changes are entirely forced, which does ignore the possibility that internal variability has had an impact. Best way to get rid of decadal or multi-decadal variability in EBM is too use long base and final periods, say 30 to 50 years. LC18 argue that the shorter periods they use are well matched. Imply seems a weak level of attribution. Natural variability could also exist with a low climate sensitivity. There is no must imply involved. Yes, natural variability could also exist with a low climate sensitivity (noone is claiming that it doesn’t exist). The point is that if you want natural variability to be dominant, then it implies either a paradox in which the system is sensitive to internally-driven warming but not to externally-driven warming (which doesn’t make sense) or it implies a massive amount of energy coming out of the oceans, which is not observed. 2) Climate models are linear in forcing. Modeling A and B separately and then adding the result gives the same answer as modeling A and B together. This would be difficult if errors/noise were large. 3) The seasonal forcing cycle is followed very closely despite complex fluid flow and clouds. The analogy Held uses is the thermodynamic limit of statistical mechanics. 4) Models match the observed OHC increase. As Held points out, OHC increase is characteristic of high climate sensitivity. Even if good model performance is due solely to tuning, as alleged, then, at minimum, the data used in tuning are consistent with high sensitivity. In closing, I like Held’s approach of asking what a high natural variability/low ECS world would look like. Similarly, we should ask what a high chaos/model error/noise and low ECS world would look like. Hard to find a coherent signal I would think. Yet the same warming signal is easily detected in climate models and in recent observations and paleo, i.e., not the world depicted in peer-reviewed literature. I’ve seen this argument [high internal variability -> high ECS] made many times. Have you ever had a ”skeptic” make a counterargument? I could take a stab at one. But I imagine it’s already been addressed or torn apart in the scientific literature, or maybe even by Held’s argument above. Let’s postulate that the Holocene global climate has multiple potential pseudo-stable climate states, defined by different regional temperatures, wind and ocean currents, precipitation patterns, bio- or dustwind-induced aerosols, etc. Furthermore, let’s postulate that both forcing and internal variability may cause transitions between these states. The global temperature difference between these states might be relatively small, (0.1 – 0.5C), but they would indeed be stable states, where the changes are self-reinforcing and self-maintaining until internal or external variability pushes the global climate into a different state. This wouldn’t just be “pushing the energy around”; it would change the balance of energy within the system so as to change relative humidity, cloud or convective feedbacks, etc. Like, imagine that under one such state, clouds in the Pacific carry latent heat more deeply into the high atmosphere. Under another, cloud organization is not as coherent, and deep convection is lacking. Or maybe changes in wind patterns reduce the relative humidity over the oceans, reducing the water vapor feedback. Or we shift to more El Nino-dominated states, or less El Nino-dominated states, but in a way that’s pseudo-stable over centuries. Is there any reason to assume that these different potential global-qua-collective-regional climates would all have the same exact response to increased CO2 forcing? Indeed, these different potential climates might well all end up converging to a single climate when subject to our current greater CO2 forcing, even though they started from different average global temperatures. I’m not saying this is what’s happening. But it’s the kind of question that I’d ask the teacher if I were in a college climate science class. Specifically: how might variations in regional climates interact in order to create different pseudo-stable global climates? Thanks Chubbs – good read. Chris Colose has a good read over at RC, too. Good day for good reads. Windrush constructs a beautiful theory of ‘Natural’ climate changes, the only problem is the ugly absence of good historical, geological, paleoclimate support. The best evidence for flipping between stable states is the rapid transition out of deep glacial states into a much warmer interstadial. In that case a small insolation trigger causes a chain of CO2 and albedo feedbacks. Cooling back into a glacial state seems to be a much slower process. However I doubt that any such hypothesis about a physical process is required by those that invoke ‘Natural variation’. The key feature of such claims of internal variation is that they A-causal and arbitrary. They lie outside of the physics and chemistry, they are (super? )natural changes that happen as a inherent feature of the system without requiring, or any possibility, of a physical chain of causation being describable. I think there is an element of magical thinking in this. Like the Shinto and other Animist religions, the elements of the climate, along with the landscape, plants, and animals, have inherent forms and behaviours that are part of their ‘Nature’. The way things happen is as much a result of inherent essence as understandable scientific process. It is a short step from Thor throwing thunderbolts. Of course, since almost 95% of the heat goes into the oceans, we could test Windchaser’s thought experiment by measuring ocean heat content. If there was no forcing, it should remain more-or-less stable if heat is just being moved around, or vary bistably or multi-stably if we’re flipping between different albedo states. Of course, if there’s no forcing, we have to throw away the laws of physics and replace them with unicorns, but hey, it’s just a thought-experiment. So not only do we not have to answer what stops the known GHG CO2 changing the planet’s radiative balance, we also don’t have to worry about the fact that a 1°C temperature change was caused by subtle changes in climate state, so subtle we haven’t noticed them, hence ECS must be really high. Fortunately, we know OHC has increased steadily for decades, in line with predictions from known forcings, so there’s no need to invoke unicorns and we can stick with the laws of physics. The skeptics favorite mode of NV is the AMO. Why? 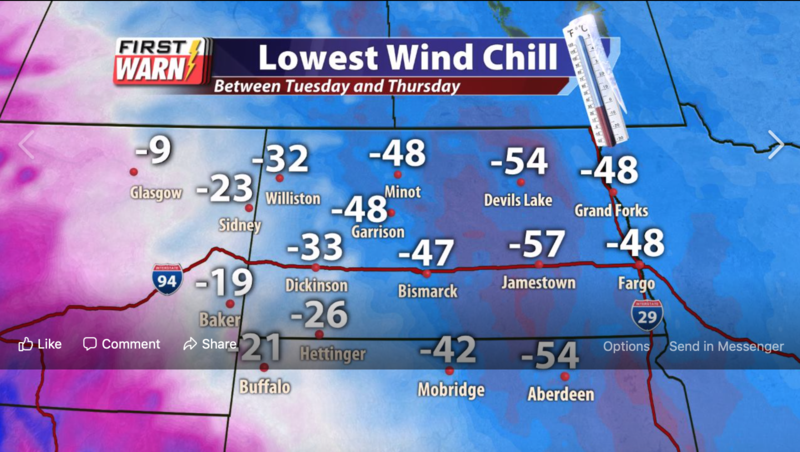 Because, like Feynman’s cargo planes, its cold phase is always coming back. Some day. Soon. Imminent. Just around the corner. So look at it. 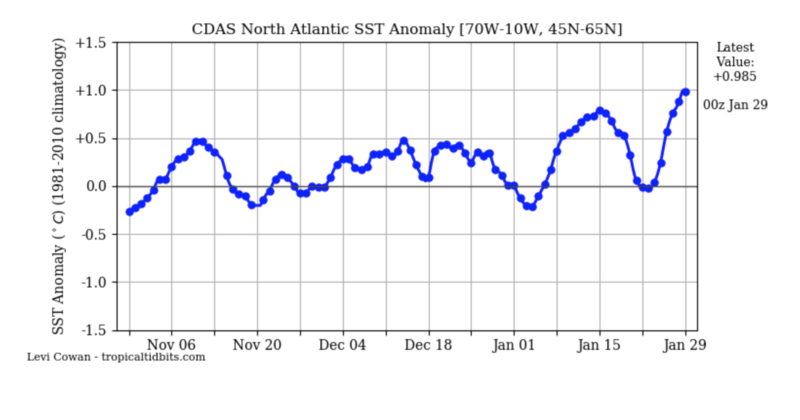 It’s the detrended SST of the North Atlantic, which is a fairly small global space. It has not had, on an annualized basis, a negative number in 22 years, which includes the cold blue blob off Greenland years. So, until AGW approaches equilibrium, in the 60-year cycle sense, (a dramatic decrease in the GMST, a cycle ) can the AMO actually go negative? Because there are an awful lot of climate papers on Google Scholar that assume a 60-year cycle that can go negative in the 21st century. But JCH, look at the right hand end of the curve. It’s still going down. You just have to believe. Strongly enough. It’s like flying in HHGG. You just have to close your eyes, step out of the window and not fall. But it just blows my mind that people, including many climate scientists, seemingly assume the 60-year cycle, usually called the AMO, is a lock. The best evidence for flipping between stable states is the rapid transition out of deep glacial states into a much warmer interstadial. The Danschgaard-Oeschger events also come to mind, though I’ll be damned if I have more than cursory knowledge about this subject. (And, those are obviously not applicable to the current climate, but are still pretty damn interesting). However I doubt that any such hypothesis about a physical process is required by those that invoke ‘Natural variation’. The key feature of such claims of internal variation is that they A-causal and arbitrary. Aye. There’s a solid difference between saying “hey, here’s an interesting potentially-unanswered question” versus extending that to “therefore, we don’t have to worry about all the stuff we do know about climate”. ref to. Dikranmarsuprial. “This seems rather unfair as they present model results that are clearly able to reproduce early 20th century warming via a mixture of natural and anthropogenic forcing.” That is called hindcasting and the models are made to fit observational data. So no surprise if it looks good. That is however not an evidence that the mixture of natural and anthropogenic forcings are correct. The only way of checking that is projections into the future. In my opinion the models don´t do well. Also, the 40´s “blip” is NOT explained by the models. Neither is the steep temp rate seen in the early decades considering almost no anthropogenic forcings. It loks to me that the anthropogenic forcings are smaller than assumed in the models. Since the TCR and ECS values are in general steadily revised downwards with time, there seem to be other people agreeing with me on this. That is called hindcasting and the models are made to fit observational data. So no surprise if it looks good. 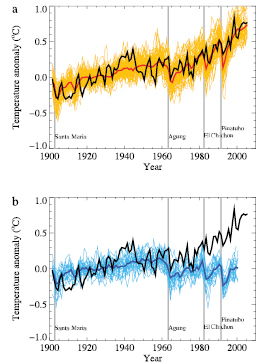 None of the models described here use the temperature trend over the historical period directly as a tuning target, nor are any of the models tuned to set climate sensitivity to some preexisting assumption. This isn’t true either. Or do you have a citation? Jan wrote “ref to. Dikranmarsuprial. “This seems rather unfair as they present model results that are clearly able to reproduce early 20th century warming via a mixture of natural and anthropogenic forcing.” That is called hindcasting and the models are made to fit observational data. (i) see comments by ATTP and VTG (ii) So what? It is still unfair to criticise the IPCC without discussing what they had to say about it. You could easily think from the article that it was nothing, but that isn’t true. So no surprise if it looks good. That is however not an evidence that the mixture of natural and anthropogenic forcings are correct. The only way of checking that is projections into the future. In my opinion the models don´t do well. Also, the 40´s “blip” is NOT explained by the models. Perhaps, but the models do get it right to an extent, and that should be acknowledged. That is the way science works, we are self-sekptical and pay if anything more attention to the evidence that doesn’t support our current views. Neither is the steep temp rate seen in the early decades considering almost no anthropogenic forcings. That simply isn’t true. Fossil fuel emissions only overtook land use change emissions in the 1950s/60s. It loks to me that the anthropogenic forcings are smaller than assumed in the models. And yet you didn’t cite them and instead made another unsupported assertion. Wow Jan, that’s impressive. Five false claims in a dozen lines of text. Perhaps you should have posted on the previous thread?